Revolutions come in waves and cycles. We are again riding the crest of a revolutionary epic, much like 1848 or 1917, from the Arab Spring to movements against austerity in Greece to the Occupy movement. Wages of Rebellion investigates what social and psychological factors cause r... read full description below. Revolutions come in waves and cycles. We are again riding the crest of a revolutionary epic, much like 1848 or 1917, from the Arab Spring to movements against austerity in Greece to the Occupy movement. 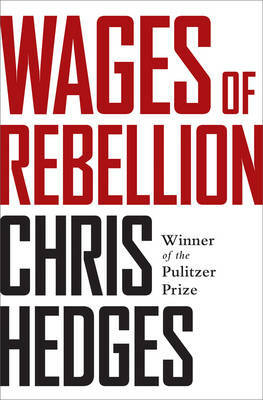 Wages of Rebellion investigates what social and psychological factors cause revolution, rebellion, and resistance. Chris Hedges, who has chronicled the malaise and sickness of a society in terminal moral decline in his books Empire of Illusion and Death of the Liberal Class, has turned his attention to the triggers of revolt. Drawing on an ambitious overview of prominent philosophers, historians, and literary figures he shows not only the harbingers of a coming crisis but also the nascent seeds of rebellion. Hedges' message is clear: popular uprisings in the United States and around the world are inevitable in the face of environmental destruction and wealth polarization. Focusing on the stories of rebels from around the world and throughout history, Hedges investigates what it takes to be a rebel in modern times. Utilizing the work of Reinhold Niebuhr, Hedges describes the motivation that guides the actions of rebels as sublime madness -- the state of passion that causes the rebel to engage in an unavailing fight against overwhelmingly powerful and oppressive forces. For Hedges, resistance is carried out not for its success, but as a moral imperative that affirms life. Those who rise up against the odds will be those endowed with this sublime madness. From South African activists who dedicated their lives to ending apartheid, to contemporary anti-fracking protests in Alberta, Canada, to whistleblowers in pursuit of transparency, Wages of Rebellion shows the cost of a life committed to speaking the truth and demanding justice. Hedges has penned an indispensable guide to rebellion. Chris Hedges is a Pulitzer Prize--winning journalist. He spent nearly two decades as a correspondent in Central America, the Middle East, Africa, and the Balkans, with fifteen years at the New York Times. He is the author of numerous bestselling books, including Empire of Illusion; Death of the Liberal Class; War is a Force that Gives Us Meaning; and Days of Destruction, Days of Revolt, which he co-wrote with Joe Sacco. He writes a weekly column for the online magazine Truthdig. He lives in Princeton, New Jersey.